One of the design bloggers I follow is Chris Spooner at his site SpoonGraphics. I have learned so much through his tutorials and I love his freebies. Today he posted a pack of design elements through Design Cuts that I may or may not have run to the computer to purchase. I am loving the handmade style that is prevalent in the graphic design arena right now, but I do not have the time to create these elements myself. That is why I am super thankful that other artists do that part of the work for me, letting me devote more time to the design work that I adore. Normally, I would like to make a few example items to show off what these sets can do, but I don’t want to wait to post this long enough to do that. 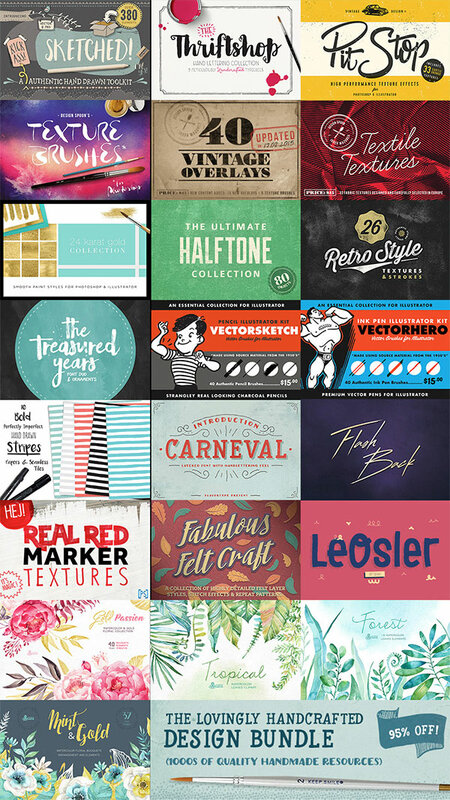 If you are looking for some resources and ideas for your design/web/scrapbooking, I highly recommend checking these out. This entry was posted in Life and tagged Design Cuts, elements, graphic design, SpoonGraphics on 2015-10-07 by Jill.